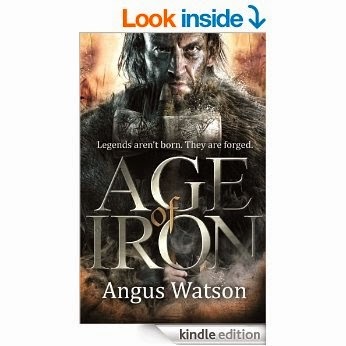 Age of Iron (The Iron Age Trilogy Book 1) by Angus Watson. LEGENDS AREN'T BORN. THEY'RE FORGED. Dug Sealskinner is a down-on-his-luck mercenary travelling south to join up with King Zadar's army. But he keeps rescuing the wrong people. First, Spring, a child he finds scavenging on the battlefield, and then Lowa, one of Zadar's most fearsome warriors, who's vowed revenge on the king for her sister's execution. Now Dug's on the wrong side of that thousands-strong army he hoped to join �- and worse, Zadar has bloodthirsty druid magic on his side. All Dug has is his war hammer, one rescued child and one unpredictable, highly-trained warrior with a lust for revenge that's going to get them all killed . . . I stumbled upon this book awhile ago and the sequel has just come out, so I thought I'd do a quick review of this book. For the last few years I've stopped buying/reading published books, as I've found them much more expensive than indie books, but Age of Iron sounded intriguing and I'm glad I paid the extra money for it. The novel is a historical fiction with dashes of fantasy in it. The storyline is set in Britain, just before the invasion of Rome and has three main characters. You have Spring, a rather precious young girl with a mysterious background, Lowa, a female warrior who finds herself betrayed by her king, and finally Dug Sealskinner, a veteran mercenary, and my favourite character. I think one of the main reasons why I found this book so captivating, was not because of the action, which was written well by the way, but the characterisation. Each of the three main protagonists were fleshed out and had striking personalities. And I must say, Angus Watson did a terrific job in creating Dug. I think I must have had a permanent smile etched on my face whenever I read his POV. Dug's actions and what he said at the most inappropriate of times, had me laughing. He's exactly what I want in a hero - someone who doesn't take life seriously and most often than not stumbles through to success. What I also liked was the amount of strong female characters in this book. They were as equally ferocious as the men and fought just as hard, if not harder. While I didn't like Lowa for the decisions she made, I couldn't help but admire her will to fight. This book had the perfect blend of humour and action, which made the story enthralling. And having bought the sequel already, this series is one to watch, or should I say read.